Has your doctor recommended a CPAP machine for you or a member of your family? This machine helps many people breathe better at night. After a diagnosis of sleep apnea , there is often a case of information overload. In addition to the questions you may have about using this machine, you may have questions about keeping it clean. Clean your CPAP machine at the same time every day. Many people incorporate it into their morning routine, so they don’t forget to clean it. To avoid damaging your machine, mask, and hose, keep it out of direct sunlight. Place your CPAP machine on a level surface to not interfere with the air intake. Keep a schedule of when to order replacement parts for your machine to make sure your equipment is always ready to use and that you get the most out of your CPAP therapy. To ensure your CPAP machine functions correctly, you should clean it weekly. Additionally, to keep your machine working properly and prevent the risk of infectious diseases, it is important to keep your equipment dry and clean. Cleaning it helps to remove germs and bacteria that can get trapped in your tubes and mask and can help you or a loved one avoid the damaging effects of unhealthy germs and particles stuck in your CPAP machine. Unfortunately, many cleaning methods do not do enough. To have successful CPAP therapy, you must be willing to make both your treatment and keeping your equipment clean a priority. 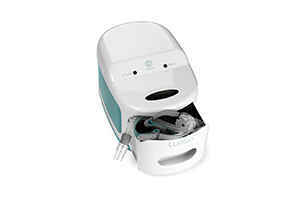 An easy way to sanitize your CPAP mask and humidifier quickly is by using a CPAP sanitizing machine. Lumin vs. SoClean: Which is Right for You? 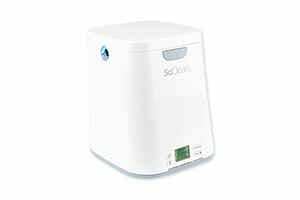 Lumin and SoClean are two of the most popular ways to clean and sanitize your CPAP machine without using water or chemicals. To clean your machine using one of these sanitizing devices, you open the lid of the cleaning machine, place your CPAP mask inside, and close the lid. Unlike other cleaning methods, there is no need to take your CPAP mask and hose apart when cleaning, adding to the ease of use. The Lumin sanitizing system is compatible with many CPAP brands and models. It is an easy way to sanitize your CPAP mask, hose, and water chamber with a powerful light that kills 99% of harmful bacteria, viruses, fungus, and mold. This light works to disinfect your CPAP parts without using water or harsh chemicals. Lumin is fast, taking only five minutes to clean your machine. After placing your mask in the cleaning chamber and pressing a button, the machine begins to work. In just a few minutes, the machine chimes to alert you that your CPAP machine is clean and ready to use. You can also use Lumin to clean and disinfect other items like toothbrushes, dentures, hearing aids, and glasses. 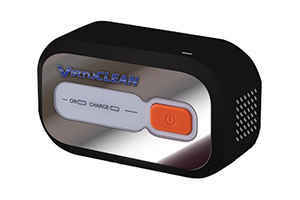 SoClean is another quick and easy way to clean your CPAP machine effectively. Much like Lumin, SoClean is compatible with many CPAP models and brands, it kills 99.9% of bacteria and germs, and does not use any water or chemicals in the cleaning process. Unlike Lumin, SoClean uses ozone to disinfect and sanitize your CPAP’s mask, hose, and reservoir. Ozone works to destroy harmful pathogens like E. coli, influenza, strep, and staph. In ten minutes, when the SoClean finishes cleaning your CPAP equipment, it is dry, sanitized, and ready for use.